With several years of experience and knowledge, we are engaged in offering a wide assortment of Kraft Paper Corrugated Boxes. These Kraft Paper Corrugated Boxes are manufactured using premium quality kraft paper. 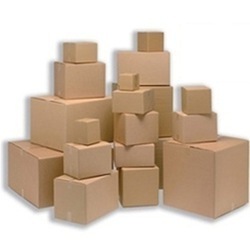 Besides, these Kraft Paper Corrugated Boxes are available in a variety of different colors and sizes. Packwell Industries is a prime name in the manufacturing and supplying of various categories of packaging boxes and various other such related items. Our products are very much in demand throughout the year by various categories of industries, which trust on us for their packaging needs. Situated in Secunderabad, Andhra Pradesh, India, we are a Sole Proprietorship Company. These boxes are in huge demand for packaging purposes. Our product list includes Corrugated Boxes, Box Partitions, Heavy Duty Corrugated Boxes, Packaging Boxes, Corrugated rolls, Carton Boxes, Printed Boxes, Corrugated Sheets and Corrugated Liners. All these products are the feathers in our cap which help our company to rise up more. The backbone of our company is a very able team of 11-25 people who work 24x7 to cater to our most esteemed customers and clients. Our annual turnover of 50 Lakh -1 Crore INR is really a very great achievement for us, as it helps us to stay alive even during turbulent market conditions.